Recruit a new Dean who is committed to long-term support for cultural transformation (p. 5). Develop metrics of excellence to measure program and department performance to prioritize investment (p.6). Hold all levels of leadership accountable for achieving the metrics of excellence (p. 5). Report financial results and hold leadership accountable for sharing with faculty (p. 6). Substantial investment for recruitment of early career faculty with demonstrated potential for excellence in research in targeted areas (p. 7). Strategically build technological infrastructure and operational services (p.8). Support exemplary educational practices through a series of certification programs (p. 10). Strengthen curricuum changes related to the future of health care delivery (p. 11). Improve relationships with health care partners to ensure a comprehensive learning experience (p. 10). Create an academy of master clinicians (p. 12). Improve the clinical scholar track (p. 12). Support UMP patient care strategies (p. 13). The lack of a sustained vision for "what we want to be" has resulted in haphazard additions of new buildings without any way to maintain their infrastructure, faculty hiring without clear reasons for increasing the number of faculty members in a particular area, and insufficient long term planning to sustain the growth that comes with the building of buildings and the hiring of faculty. We are a large research university with an aging, inadequately funded and maintained infrastructure that makes it increasingly difficult for faculty to maintain cutting edge research programs. Faculty are frustrated due to (1) lack of their input in decision making, (2) lack of transparency in finances and decision making at the top, and (3) token solicitation of and lack of responsiveness to their input in all matters. There is universal concern about leadership in the Medical School at all levels, from division chiefs and chairs in clinical departments up to and including the dean's office. In order to address these concerns we believe significant change in leadership must occur. See the Faculty Advisory Council Report (emphasis added). This Report is not an indictment of leadership by a couple of disgruntled faculty members. The Council includes three dozen members who are elected by their peers in the Medical School as representatives to the All University Senate. A final, personal comment on the cost of medical education: our oldest daughter graduated from the U of M Medical School in 2008 with medical school debt in excess of $200,000. (She is now serving as an OB-GYN physician for a non-profit organization that serves migrant farm workers and their families.) The Strategic Plan recommends increasing scholarship aid for medical students. This is not a solution. The "high tuition high financial aid" experiment has been a disaster for students and their parents as well as for our society that will depend on well-educated young persons for its future. It was a gee-whiz innovation, a concept that would later help thousands of companies earn more money, but to John Riedl, it held a different kind of promise: Making people’s lives a little better. 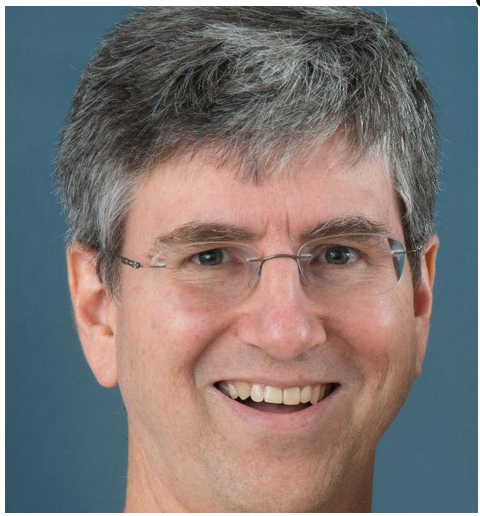 Riedl, a computer scientist and University of Minnesota professor, helped create the field of recommender systems, which allow computers to predict what products or articles someone might enjoy based on other people’s preferences. Think Netflix. He later became an expert in social computing and systems that rely on users’ contributions. Think Wikipedia. The McKnight Distinguished Professor, passionate thinker and dedicated dad died July 15, three years after being diagnosed with melanoma. He was 51. Riedl was born in Evanston, Ill., and grew up in Ohio, where his dad was a mathematics professor and later an administrator at Ohio State University. 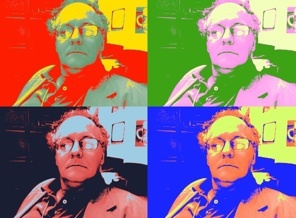 Riedl’s career took off in the early 1990s, with the publication of a paper, cowritten with Paul Resnick, on recommender systems — complicated computations that make use of like-minded people’s opinions on films, restaurants and products. To commercialize that research, Riedl co-founded in 1996 the company Net Perceptions, which would grow to more than 300 employees and boast a $60-a-share stock price before being crushed by the dot-com collapse. He later worked to quantify vandals’ effect on Wikipedia and build tools to encourage greater, better participation. One recent paper by his research group found that Wikipedia is overwhelmingly edited by men. Riedl himself added information on new therapies to the Wikipedia page on melanoma. He approached the disease with the same curiosity and careful study as his own research, said Maureen, who works in the U’s Medical School. Despite a dynamic career, he kept his family a priority, delving into his three children’s interests. He cowrote an academic paper with his oldest son, Eric, a mathematics graduate student at Harvard University. He watched sports with Karen, 24, who is working on her Ph.D. in pharmaceutics. He learned to play video games to compete with Kevin, 22, who is studying mechanical engineering. In a short speech at a gathering a few weeks before his death, Riedl asked his friends not to feel sorry for him. Riedl’s survivors also include his parents, John and Mary, and his siblings Ann, Jim, Steve, and Dan. Services have been held. In response to yesterday's post (For the Record) an important offline comment was made. The University Plan, Performance, and Accountability Report, now in its ninth year, is a broad, governance-level discussion of the University of Minnesota’s fulfillment of its mission and its success toward its aspiration of becoming a top-three public research university in the world. While university rankings are often a topic of great interest to the general public and infl uential in changing or, in most cases, reinforcing perception, these rankings have several limitations which make them inappropriate for strategic planning and monitoring progress. Two of the most significant limitations are, first, that the rankings are not guided by any empirical and theoretical framework to justify the selection of measures and methodology employed, and second, that the rankings adjust methodologies annually, making year-to-year analysis difficult and meaningless. Now the president again commits the University to the pursuit of the meaningless. Summer time and no one pays much attention to the hard problems. So some important points will be raised now and developed in the Fall when people are again paying attention. "One of the University’s long-term goals is to be one of the top three research institutions in the world. 'Our research really does define an absolutely critical element of this institution,' President Eric Kaler said at the meeting." Don't we ever learn anything at the University of Minnesota? This is absolute and total nonsense. "In the world" ? Why not in the universe? Can Big U Become Great Big U? And of course the Twitterverse is not stifled over the summer. There, soundbites reign supreme, rather than honest discussion. Rankings are a loser's game. We've been through this before. Touting them just makes us look foolish. Sadly, at the U of M, even Goldy has a price. The bride, Samantha Jones, lined up at quarterback in her wedding dress at TCF Bank Stadium and led her guests down the field for a touchdown. 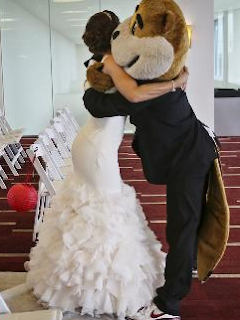 She paid $5,700 to hold her wedding at the stadium, and an extra $400 to hire Goldy Gopher, the University of Minnesota’s mascot. Sherwin Williams has held large trade shows at the school’s football stadium and had Goldy Gopher pose alongside a large truck with the company logo. “They bought a bunch of paint from us when they built it,” said Rob Montgomery, a Sherwin Williams district manager. General Mills used the stadium for movie nights, with the feature film showing on the large scoreboard. In an attempt to find revenue in unusual places, the university has been renting out its four-year-old football stadium for everything from weddings and bar mitzvahs to Tennant Company meetings and Comcast awards banquets. The president’s suite, overlooking the field and featuring a built-in bar, rents for $600 for six hours.Wedding and bar mitzvah packages also offer an opportunity to rent the school’s spirit squad and marching band, with a brass quintet renting from $150 to $300 an hour. “You get to rent Goldy? Yeah, that’s great,” Bill Gleason, an associate professor at the university’s medical school, said sarcastically. Gleason, a faculty member since 1992, has been an outspoken critic of the school’s corporate relationships. “It just doesn’t smell right,” he added. Gleason said he believes the rental money, which goes to the school’s athletic budget, should go to the university’s general fund or to reduce student fees. To whom does the stadium belong and where should funds go that are made from its rental? What is the cut for the poor exploited student rodent and what is the cut for his masters? Students are paying a fee for the Bank debt retirement, even if they never set foot in the Bank. Of course we could always hold graduations in the Bank so that every student would have to "set foot" in the stadium. The Bank is shorthand for Twin City Federal Stadium. Telling. Preface: Strategic planning is a triangle whose cornerstones are 1) culture/climate; 2) leadership; and 3) infrastructure/programs. The comments from the FAC members have raised opportunities for improvement in all three domains. The comments are summarized in this report, with an attempt to group them into categories relevant to the strategic planning process. Included in this report is an appendix which includes all the original, unedited comments made by faculty who are members of the Medical School Faculty Advisory Council to the Dean. They were gathered either via email or at the six individual meetings that were held over a period of three weeks. There was no attempt to cull or edit these concerns, and thus there are some redundancies. However, we believe it is important for the Strategic Planning Committee to see the depth and breadth of concerns raised by faculty members on the FAC, whose members represent every department in the Medical School. We have attempted to identify areas of strength and weakness within the current medical school structure with a focus on how we can get better. There are several basic questions we collectively believe need to be addressed. First, how can we restructure/reinvent the Medical School for what we believe are the future realities? Second, what can we do to affect areal and substantive sea change in our climate/environment? A subordinate but integral question that underlies this need to reinvent ourselves is just as important: What strategies can we use to “turn around” the scarcity of resources in the medical school? Question 1: What are our top strengths or strategic assets of the Medical School for each of our three part mission: Clinical care, research and education? The faculty identified a number of areas of strength within our medical school. Clinically we are a highly regarded clinical medical school, known to produce diverse and well- trained medical doctors with a focus on primary care. The UMN is among the few schools that graduates significant numbers of Native American physicians, and Duluth accomplishes its mission of producing rural physicians so well that UMN is ranked in the top 5 medical schools nationally. This is strengthened by UMNTC’s urban medical center, where the size and diversity of our patient population enables our clinical training to be very strong. Collectively, faculty members in the medical school are excellent, with strong records of excellence in research, educational scholarship and teaching. Moreover, since we are a large research university, there are ample opportunities for collaboration within and amongst the research faculty. These collaborations have been strengthened in a number of areas where there is a concentration on specific diseases and/or translational research. This includes such areas asTranslational Neuroscience, the Lillihei Heart Institute, the Center for Magnetic Resonance Imaging (CMRR), and the Muscular Dystrophy Center. These areas of focus have emerged and depended upon the efforts and vision of faculty members who have recognized the potential such centers can provide in terms of synergy, and have used as much influence as possible to affect faculty hiring to further support the missions of these centers. Question 2: What do you believe are the top opportunities for the Medical School between 2013-2015? In general, the comments we received in this domain focus on 3 areas: i) the benefit of modernization – updating our infrastructure; ii) changing the current leadership model school-wide; and iii) focusing on developing the capacity of current faculty members. The collective view is that by focusing on these areas, meaningful and substantive changes will result, improving the climate, leadership, and professional capacity of the faculty in general. To summarize, the top opportunities can be addressed in four main ways. First, it is clear that the faculty see a need to develop a collective vision. We need to develop a 10 to 15 year plan for budgetary and sustainable excellence. This will help us build “pride of place”, which in turn will help improve public perception of the University of Minnesota Medical School as the place to go for cutting edge, quality, and accessible clinical care, biomedical education, and cutting edge research. Second, there is a universal concern about leadership in the medical school at all levels, from division chiefs and chairs in clinical departments up to and including the dean’s office. In order to address these concerns, we believe significant change in leadership structure must occur. We need to provide for meaningful leadership review. A corollary to this would be to require that all medical school leadership positions have 5 year term limits. Only by overwhelming faculty vote could terms be increased by another 5 years. This would ensure that everyone, leadership and the faculty doing day-to-day work, would have a similar vision and mission. In addition, it would help build leadership capacity within the faculty members in general. Third, in order to facilitate the first two goals, we need to begin building our pipeline of future clinician/scholars starting with medical students, residents and fellows. We have a critical need to rebuild the ranks of tenured/tenure track faculty in the medical school. There is an increasing loss of mid-career faculty members, and this is a devastating loss to us in terms of investment in new faculty members who leave just as they are entering their most productive period. Finally, to achieve any of these goals, we need a sustained and balanced investment in the career development of all faculty members. We need mentors to help new faculty develop their clinical and research programs. We need mentors to help established faculty maintain research and clinical excellence, and we need mentors to help develop leadership capacity in more senior members of the faculty. Organizations that use a mode of distributed leadership and whose “reporting structures” are shallow are more entrepreneurial and productive, as well as happier. 3. What critical future research, educational, and clinical trends do you believe we need to consider (as threats or opportunities) as we develop the strategic plan? In general, the faculty felt there is a collective need for all of us to have the “courage of our convictions”. We need to plan our vision well and then BE BOLD AND TAKE RISKS! This area focused more on potential solutions rather than threats to medical school excellence. In summary: several key areas stood out in our consensus discussion in the areas of leadership, climate, programs/infrastructure, and funding. The biggest concern in the domain of leadership is that there has been no clear long- term plan for buildings (why do we need it and how will it be maintained), for faculty hiring (how many faculty do we need to accomplish our basic mission), for retention of mid-career faculty (which we are preferentially losing without any “exit interviews” to determine why these faculty members are leaving), and finally no plan for raising funds for an endowment and raising awareness/funding levels for the medical school at the legislature. This lack of a sustained vision for “what we want to be” has resulted in haphazard additions of new building(s) without any way to maintain their infrastructure, faculty hiring without clear reasons for increasing the number of faculty members in a particular area, and insufficient long term planning to sustain the growth that comes with the building of buildings and the hiring of faculty. In the domain of culture/climate, it has become clear that we need to define the role of research at our medical school. We are a large research university with aging, inadequately funded and maintained infrastructure that makes it increasingly difficult for faculty to maintain cutting edge research programs. Without a means to facilitate, for example, the creation of genetically engineered mice or to perform the advanced genomic and proteomic studies needed as preliminary data for grants, the faculty becomes less and less competitive when applying for external funding. If we are a research university, then this research needs adequately supported (hardware and cost) infrastructure. This brings us to the reason for declining infrastructure, and this is basically the scarcity of research funds outside the NIH or NSF dollars the faculty collectively bring in through grants. The Medical Schools needs to work hard to increase popular support from the state in general and the legislature specifically. We should have the “home team advantage” as the only state-supported research university in the state. Why don’t we? We collectively need to decide to be “excellent”; excellent in research, excellent in education, and excellent in clinical care. We need to understand why people do not come to us for medical care. We should be the “go-to” place. This means that we have to invest in “cutting-edge” technologies in both clinical care and research that will set us apart from other medical providers in the state and the region and keep us competitive in the national research arena. This can only be done when we collectively and mutually define ourselves and develop a clear identity. A third area that the faculty have found particularly problematic is in the area of infrastructure and programs. We have spread our faculty all over the place. How can we better connect our faculty to each other, to staff, to resources, to infrastructure? It is well known that collaborative interactions are increased when people meet each other at lunch or walking down the hallway. We have single departments that are spread out in 8 buildings. This is DEATH to collaborations. The medical school needs to develop strategies for facilitating our research. There are increasing numbers of hurdles due to the decentralized “business” approach that has been foisted on the faculty in recent years. If our department structure is outmoded, we should redefine it. If it is still functional and important, we need to bring department members together under one roof, and not continue to rip apart faculty members from their departments and spread them all over the place. One critical area that would enhance our research potential is to develop support structures that will fund early ideas and protect research time to increase the likelihood external funding can be obtained. The University of Minnesota-Mayo partnership grants prove that this works, but the funding is limited to only a few groups. Other states have specifically received funds for this type of thing from their legislatures. We need to put together a plan and create a climate for discovery. The biggest threat to the Medical School is funding. We face declining patient revenues (which affects research and education), decreased funding for graduate medical and research education, and decreased NIH research funding. We have to clearly define the scope of the medical school of the future and come up with sustainable funding strategies. Currently the suggestion to simply ‘submit more NIH applications’ seems pointless at a time of decreasing NIH dollars. Potential solutions that the faculty envisioned would be to increase philanthropy, both medical school-wide and in each department. We cannot depend on MMF/University Foundation to do this. We all must participate in this. It is also imperative that we increase state funding for our only state-supported medical school. The state reaps great benefits from the health care professionals we produce, but they do not pay for it. We need to do a better job of telling our state representatives the “return on their investment” they receive, and why it is critical to support the research engine of the medical school to support our educational excellence. Another way to increase funds for the medical school is to increase our clinical areas of strength. 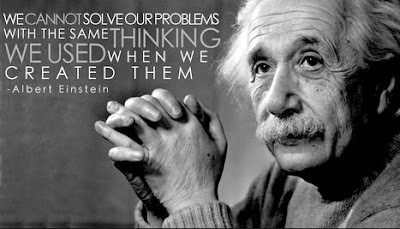 We need to develop new clinical programs that will draw patients based on future health trends, such as geriatric centers, centers for Neurodegenerative Disease and/or autism, and the like. Every year the CDC publishes the 15 most common causes of morbidity and mortality. These may differ a bit for Minnesota, but they are well known. We should be preparing ourselves to become centers of excellence in the major causes of disease in our state and nation. Question 4: The AHC Review noted a general “malaise” of the Medical School and its faculty in their report. What do you feel are the top three reasons for this “malaise”? Many of the issues raised echo what has been stated in previous sections and relate specifically to the current climate/culture in the medical school. Climate and culture set a world-class institution apart from a mediocre one. In general, many feel they have minimal voice in decision-making with little discussion, especially if one disagrees. In fact, many faculty members have stated that they have been harassed if they disagree with a decision made by clinical chiefs, department heads, or various assistant and associate deans.The consensus is that climate/culture needs to be an area of focus of the strategic plan. Meaningful leadership reviews with turnover as the rule would help. Governance: Specifically faculty are frustrated due to 1) lack of their input in decision making, 2) lack of transparency in finances and decision making at the top, and 3) token solicitation of and lack of responsiveness to their input in all matters. Many also feel that there is little room for discussion if they disagree with decisions that are made at departmental or medical school administrative levels. Leadership: Faculty members are frustrated by the fact that the UMP mission, and particularly the Fairview mission under its current administration, is not concordant with the academic mission of a medical school. In addition, we seem to have “leaders for life”. Many faculty members are quite unhappy at the division or department level, but have no recourse. This could easily be fixed by creating term limits for the dean, all assistant, associate, and senior associate deans, department chairs, division chiefs, etc. which additionally would include 360 reviews of those holding these positions. Moreover, all administrators should undergo the annual review that is expected of the faculty. Support: Lack of support for the faculty is exemplified by 1) lack of protected time making it hard to maintain scholarly productivity, 2) lack of sufficient bridge funds especially Duluth, 3) an aging faculty with very few middle-level faculty, and 4) hiring largely or only on teaching or clinical scholar tracks. This represents misuse and abuse of these types of faculty, when tenured or tenure-track faculty should be hired. Summary: It is clear that the faculty love their research, love teaching and training the next generation of clinicians and research scientists, but are more and more hampered in their efforts by aging infrastructure, weak leadership, and lack of a collective vision for the medical school. We are all particularly excited at the potential offered by the Faculty Led Strategic Planning Committee initiative. We hope these collected thoughts are helpful to you as you develop a strategic plan that will become the cornerstone of all we do in the next 20 years. All faculty comments are included with no editing. Question 1: What are our top strengths or strategic assets of the medical School for each of our three part mission: Clinical, research,education? One strength that encompasses all three domains is the strong cross-school (Medical School – SPH; Medical School-Engineering etc.) and cross-departmental (centers – Neuroscience, translational neuroscience, muscular dystrophy center, etc.) collaborations that are possible. We have an excellent variety of clinical cases, many of whom are receiving innovative treatments unique to this institution (Bone marrow transplantation for epidermolysis bullosa comes to mind). NIH funded research in basic science in Duluth (who teaches medical students in Duluth). We turn out great primary care physicians (70 %?) to serve Minnesota. We have a good physical facility for education and, at least at the department level, a strong commitment to education. Provide for meaningful division chief, department chair, assistant, associate, senior associate deans, and medical school dean 360 reviews. Limit all terms to 5 years, with the potentialto be voted back into the position for another 5 years. Increase the collective faculty voice in medical school decision-making. Stop top-down dictates and develop a sense of collective vision and purpose. (e.g. higher level medical schoolleadership shows distain for faculty; make decisions without understanding what faculty need; focus on a few “superstars” and ignore everyone else; don’t know what the averagefaculty member is doing; goals of the faculty and the higher level medical school administration are not aligned; goals of Fairview are not aligned to the needs of academic medicine,etc. Run the medical school governance like a democracy not like an autocracy. Increase transparency of how the medical school works. Increase the openness to change. Striving to be better is not “subversive”. Physical distances are an increasing problem. The closer colleagues are to each other the more they collaborate. The further they are from each other, the less likely they are to collaborate. Develop a sense of pride in our medical school. ? Create a culture that defines WHO WE ARE and WHAT WE DO. We have the opportunity to become the top institution for developmental clinical medicine in the upper Midwest. Facilitate research in cutting edge areas of medicine and research: nanomedicine, stem cells, RNA-Seq or Chip-Seq genomics technologies, bioinformatics, and tissue procurement.We are falling behind on keeping our facilities up-dated and adequately staffed to ensure rapid turnaround. The lack of faculty access to these technologies makes us less competitive forR01 and other grants. Focus on doing a few things really well – continue to develop centers of excellence. These could focus on main, current causes of death/disability (causes of death according to theCDC): Psychosocial, Heart, Cancer, Trauma, Neurodegenerative Diseases, and Chronic Respiratory Diseases. Recruit and retain the best faculty. Increase support for current faculty: reinstate hard salary lines for faculty; support shared facilities to enhance our research capacity; etc. We can only recruit great faculty if wehelp make our entire faculty great. Develop improved pathways for collaborations and facilitate information sharing and collaborative connections between schools (Med. School and Biomedical Engineering, SPH, CLA,etc.) and between departments. Increase the opportunity for and develop pathways for Public-Private Partnerships for Entrepreneurial activity of faculty. Facilitate research in cutting edge areas of medicine and research: nanomedicine, stem cells, RNA Seq or Chip-Seq genomics technologies, bioinformatics, and tissue procurement.We are falling behind on keeping our facilities up-dated and adequately staffed to ensure rapid turnaround. The lack of faculty access to these technologies makes us less competitive forR01 and other grants. Increase and facilitate collaborations between MD and PhDs. Develop an “ambassador” program: identify faculty who know a lot about the people and the resources of the medical school/university. Assign all new faculty members anambassador to help them get integrated into the medical school research and clinical communities. Ambassadors could also help with recruiting new faculty – get visiting jobapplicants connected with people who will help recruit them here. We could and should pursue becoming outstanding in medical device development and biomedical engineering. Re-engineer are medical education so students understand the “checklist manifesto” – quality, safety, use of metrics. Improve the sense of medicine as “teamwork” between MDs andother health care practitioners. We have the potential to become one of the top medical schools in providing outstanding education. Increase public awareness of the medical school gems. We need to “toot our own horn” much more so the public understands what we do. (CMRR, etc.) Identify areas of strength andbrag. Make sure it includes all departments. Improve the relationship of the U of M medical school to the state: both legislatively and with the public. We are not seen as “the place to go” for medical treatment. Spread the word! (e.g.why don’t our doctors refer patients in-house? –time to make appointments is too long; understaffed due to budget concerns, etc. Help facilitate studies on lower cost approaches to treatment. 3. What critical future research, educational, and clinical trends do you believe we need to consider (as threats or opportunities) as wedevelop the strategic plan? Leadership that does not authentically involve faculty in decisions about the medical school that affects them. Processes for choosing leaders that consult only those currently in those positions, and thus those chosen are all the same. No process for review of those in leadership positions by those they work for – faculty, staff, etc. Under-appreciation for the diversity of medical environments for training of medical students and residents offered by affiliated hospitals. Overuse and misuse of the clinical scholar track instead of tenure-track faculty. Reduces faculty voice and increases individuals’ sense of vulnerability to the “whims” of leadership at alllevels. Decreasing NIH dollars – how do we change our dependence on this money? Decreased medical reimbursements – need a plan for how resources are used and distributed. Increase our cutting edge translational efforts – nanomedicine/medical devices/new drugs.Research trend is “large group science”. How can this be facilitated? There is a major need for IT support and infrastructure that is stable, reliable, and has growth potential. It will be impossible for us to match or exceed success of similar institutions if ourIT is outdated. The potential discussion of a merger between Fairview and Sanford has the potential to adversely affect the clinical practice of medicine at the university. The well-publicized billing scandal involving the leadership at Fairview has also harmed the reputation of the institution and may harm the clinical practice of medicine at the universityas well. Research is dependent to a large and in my opinion too great extent on government grants. This makes research at this institution dependent on the good-will of governmentbureaucrats. There is overuse and misuse of “teaching scholar track” instead of tenure-track research oriented faculty. This has resulted in significant decreases in educational richness and faculty expertise. Increasing our teaching load is not the way out of our financial problems. We need to focus on developing areas of expertise that are different than those available in the community. Decreased medical reimbursements – need a plan for how resources are used and distributed. Facilitate cooperation between the U of M Hospital and all the affiliated hospitals to better access patients for clinical research. Question 4: The AHC Review noted a general “malaise” of the Medical School and its faculty in their report. What do you feel are the topthree reasons for this “malaise”? 2. Lack of transparency and accountability in governance (with respect to decision-making, finances, etc.). 4. Lack of faculty voice in decision making. There is a token addition of faculty input to decision-making. 7. Misuse and overuse of the clinical scholar track. Those in the track are not given any protected time for research yet scholarly product is expected. 10. Very poor leadership at UMP, the hospital and the medical school. 11. There are also no means for faculty to have input into replacing these people in leadership positions despite of our providing most of their financial support. For example, if a faculty member is nominated to run for a spot on the UMP board they first must pass through a nominating committee. 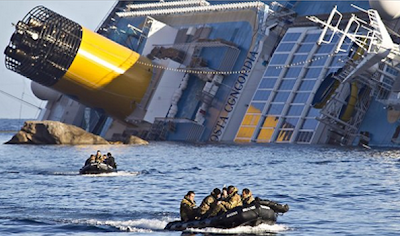 The nominating committees only chose people who will not “rock the boat.” The result is that poor leaders are never eliminated. The leadership issue is so important that it dwarfs any other concern. Huron Consulting Group recently submitted its diagnostic and benchmarking study of four U of M administrative offices: finance, procurement, human resources, and information technology. The University has undertaken recent efforts to measure the resources related to distributed [decentralized] administrative functions; however, total administrative costs are still difficult to measure (p. 41). Financial cluster staffing levels and organizational structures are inconsistent across UMN at the distributed level [outside central administration](p. 46). Managerial reporting lacks clear processes and accountability (p. 53). Although central Finance owns the financial functions, there is limited oversight of the performance of distributed finance staff (p. 54). UMN has done substantial work to develop metrics in some areas of financial administration, notably cost of mission, but has not combined them into an integrated program that allows consistent comparison across units (p. 56). Central offices do not directly oversee distributed roles and do not have direct accountability for accurate and timely payments or control of vendor relationships (p. 59). Central organization spends time tracking missing imags across all types of invoicing rather than focusing on fraud or policy auditing (p. 76). The University has a high volume of checks [71%] versus more efficient electronic payment methods (p. 78). Gaps in current process make it difficult to anaylze travel expenditures (p. 69). The integration between distributed units and OHR [Office of Human Resources] is not always effective (p. 86). Lack of integration between financial and HR modules (p. 86). Individual HR functions collect and monitor some performance metrics, but they tend to be focused on volume of activity rather than outcomes (p. 84). While UMN has more data on distributed IT resources than some peers, it does not have a full, detailed picture of total IT expenditures (p. 109). The University does not have a systematic process for evaluating IT services across the entire system (p. 120). IT across units has grown organically, often without clear roles and responsibilities (p. 121). Existing timelines for consolidation initiatives span multiple years and are potentially longer than necessary (p. 124). An internal survey of the University's non-collegiate units demonstrated broad variation in staffing levels for administrative functions and the fragmentation of roles (p. 148). While the University's collegiate units were not surveyed, initial analysis of available data suggests similar patterns (p. 148). Financial administration requires organization and coordination of the function at all levels of the University (p. 13). Finalize service level agreements to set service expectations between central Finance and distributed units (p. 54). Actively and rigorously evaluate programs offered against the context of workforce strategy (p. 98). Scale back or eliminate programs that consume resources disproportionately to the value they provide (p. 98). Identify activities that are good candidates for consolidation (p. 103). Create a University-wide mechanism for evaluating sevices and sunsetting those that do not provide value commensurate with their costs (p. 120). Identify and measure the impact of IT investments (central and distributed) and communicate these measures to stakeholders (p. 120). Service level and cost should both be defined; evaluation of costs/service levels should be part of annual budget process (p. 123). Develop comprehensive business cases for consolidating common goods or scalable IT services (p. 124). Transformational change requires a strong vision and a shift in mindset to prioritize the University enterprise as a whole (p. 25). Service delivery redesign can significantly impact a university's culture and workforce (p. 33). Stakeholder engagement and change management are critical to building support for enterprise-wide change (p. 35). The "benchmarking" part of the Huron study is a comparison to other large universities. This has little practical value for two reasons. First, Huron received a limited response to its survey in two major areas. For procurement it received four responses (some of which were incomplete). For human resources it received seven responses (many of which were incomplete). See pp. 65, 90 of the report. Second, it is not a saving grace that the cost of administration at the U of M is comparable to other large universities. Until recently no one has been watching the store anywhere. See the excerpt from the July 2012 Bain & Co. report in Nice Work If You Can Get It. In some instances it seems that Huron misses the forest for the trees. It notes that the administration spent $39,000,000 for travel (apparently in fiscal year 2012), but that only 25% of the travel was charged on a corporate credit card that provides rebates. It recommends general use of the corporate card with a savings of approximately $150,000 (p. 68). Huron does not even ask (or answer) whether it is reasonable for the administration to spend $39 million per year on travel. Huron reports that some of the units use a shadow (second) system for financial reporting and analysis due to the perceived limitations of the Enterprise Financial System (p. 46). The EFS is one of the greatest financial boondoogles ever at the University. See A Truly Sad Story. But Huron does not discuss how the administration stumbled into this multi-million dollar fiasco or whether it should continue to pour money down the EFS drain to try to salvage the system. Huron notes that the administration is in the process of selecting a consultant to work on the job classification system at the University. This will be the second consulting firm hired by the administration on this project. See p. 4 of the January 31, 2013 report of the Civil Service Consultative Committee. In fiscal year 2012 the administration spent $35 million for administrative consulting and professional services. See On The Cost of Administration Part III. Is this reasonable? Huron does not ask (or answer) this question. Indeed, it suggests more work for itself. Huron declares (p. 151) that "refining the survey [of administrative activities] and expanding it to the academic units will be required to evaluate University-wide opportunities for service delivery redesign." With the development of the modern corporate university we have seen the emergence of the universities--consulting firms complex. The compensation of the senior administrators at the U of M now far exceeds the compensation of senior administrators in state government who have similar qualifications and duties. For example, the U of M vice president for human resources (in charge of the job classification system) receives an annual salary of $218,000. The annual salary of the state commissioner of employee relations is $112,000. The administration tells us that the compensation of its senior administrators is necessary to attract "top talent." See The Cost of "Top Talent". If the U of M has such talent, why is it necessary to hire consulting firms for such a basic task as job classification? 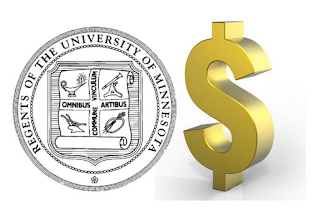 The total cost of administration at the U of M now exceeds $850 million per year or 28% of the total operating expenses. See On The Cost of Administration Part III. The explosion in this cost over the past decade has been financed by skyrocketing tuition that far exceeded the reduction in state appropriations. Concordia University (St. Paul) recently demonstrated that tuition can be slashed (by $10,000 per year) when it recognized that the "high tuition high financial aid" experiment has failed. See the September 12, 2012 front page report in the Pioneer Press. 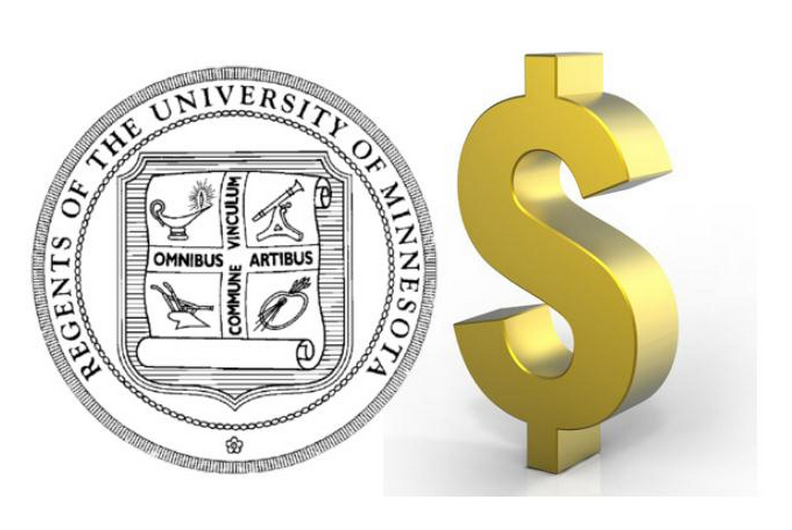 Reducing the cost of administration at the U of M from 28% to 20% of the annual budget would save $240 million. The savings should be used to reduce tuition and the crushing debt that the administration has imposed on students (and their parents). The one-half million dollar Huron report does not come close to getting us there.